Hi! Welcome to the RAK Blog Hop! I am Sarah Fleming, a Stampin’ Up! demonstrator in the USA (in central Texas). 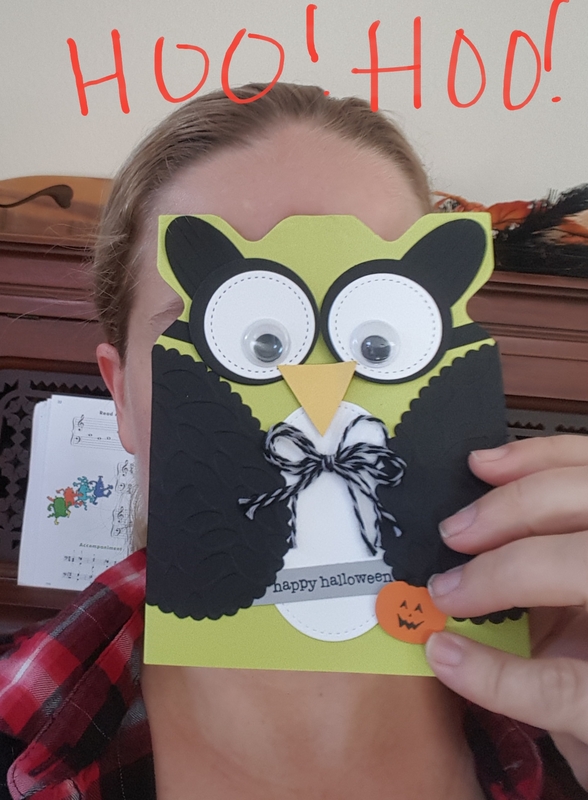 This is a blog hop to show the cards that we send and receive as participants in the Random Act of Kindness Card Group. This group is a wonderful, giving group that sends cards to each other using current Stampin’ Up! products. We’re from all over the world, and half the fun is seeing how far each card travels to its destination. 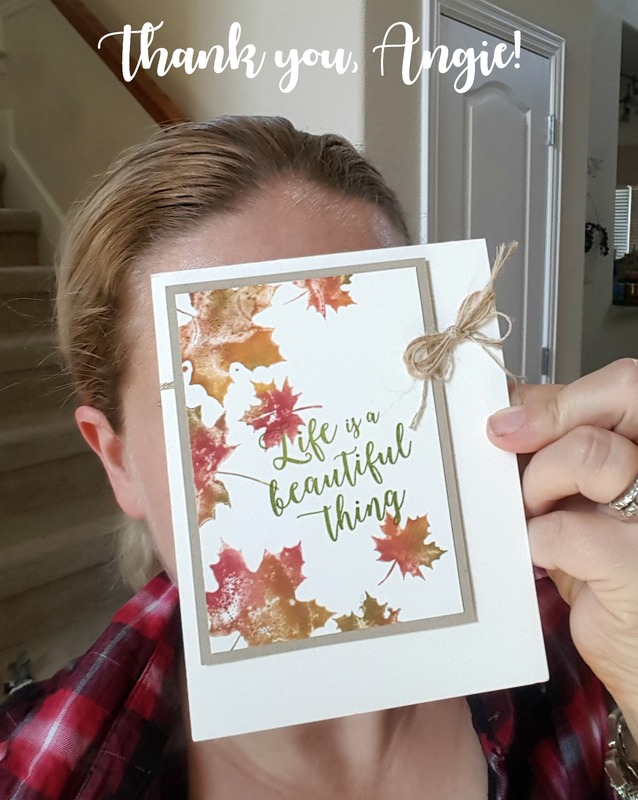 Today I’m sharing the cards I’ve received in late September and October. I am sending out my October RAK cards next week, so I don’t have any of those to show yet. I’m a little behind this month. How adorable is this card from Michelle Haney?? She has used the Envelope Punch Board to make the notches around the ears. The Stitched Shapes framelits and Layering Oval framelits make up the chest, eyes, and wings. The wings are debossed with the Petal Burst folder. What a great idea! I don’t have that embossing folder, but I’m starting to reconsider it. The Jack-o-lantern comes from the Pick a Pumpkin bundle. And there’s that classic “happy halloween” stamp from Teeny Tiny Wishes (Teeny Tiny Sentiments if you’re overseas). Thank you, Michelle! This GORGEOUS sympathy card arrived from the wonderful Angie McKenzie. The Colorful Seasons stamp set is so versatile and can be used for almost any purpose. Even sympathy. And that Jute Twine is just perfect. What a beautiful card. Thank you, Angie. I hope these cards have inspired you in some way. We’d love for you to join the Random Act of Kindness Card Group! It’s such a fun group! Make sure to go through the whole blog hop and be inspired by the other cards being sent and received this month. Just start at Jessie and go to the end.